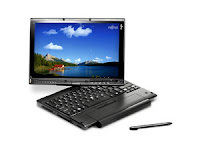 Fujitsu's Lifebook T2010 is a convertible tablet PC designed for both productivity and mobility. Most notebooks nowadays have to choose one over the other but Fujitsu has made a convertible tablet PC that has the best of both worlds. The Fujitsu Lifebook T2010's specifications include; a powerrful Intel Core 2 Duo Processor with 1.2 GHz, 2 MB L2 cache, and 533 MHz FSB, 2 GB DDRS 533 MHz SDRAM memory, a 12.1" screen, 120 GB SATA hard disk drive, Intel Wireless WiFi Link, Mobile Intel GMA X3100 with Intel Clear built-in video controller, Bluetooth, 56K modem and and 10/100/1000 Gigabit Ethernet, 2 USB ports, and integrated fingerprint sensor. The Fujitsu Lifebook T2010 also comes preloaded with Genuine Windows XP Tablet PC Edition 2005 and Microsoft Office OneNote 2007. As a convertible laptop, the Fujitsu Lifebook T2010's 12.1" display has a bi-directional hinge which when twisted, the laptop becomes a tablet PC. The 12.1" display on the Fujitsu Lifebook T2010 has an excellent viewing quality, the 300nits brightness ensures that users can use the notebook both indoors and outdoors, while the wide viewing angle of the screen makes watching DVDs enjoyable. As a tablet PC, the Fujitsu Lifebook T2010 allows you to write or draw on the screen like a conventional notepad and the special pen and active digitizer allows for more accurate pen-driven input.